I am interested in how practices and cultural trends move. In my first book, I'm looking at food records to systematically track cultural change at the court of Brandenburg-Prussia during the period of rapid expansion following the Thirty Years War. I enjoy exploring new ways to approach old sources and questions using digital tools. As a public historian, this has led to two ongoing projects with MTSU students. The first, Bygone Nashville, is an online historic tour of Nashville on the Curatescape platform. We are partnering with the larger initiative, Nashville Sites, to bring our stories to an even larger audience. Hidden Town in 3D is a collaboration with Old Salem Museums and Gardens, MTSU's Animation Department, and doctoral students in MTSU's Public History program to o recover and represent the stories of the African Americans who lived in the Moravian town in the 19th century through virtual and augmented reality. 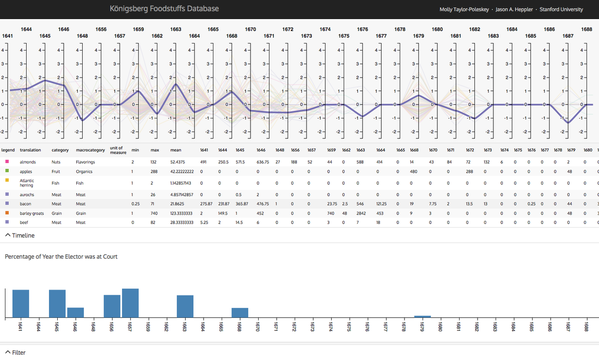 Along with Jason Hepper, the Digital Humanities Specialist in the history department at Stanford, I'm developing qualitative visualization techniques for analyzing the volumes of data about food consumption at the electoral residence in Königsberg, Prussia. I was a fellow at the Humanities+Design lab at Stanford's Center for Textual and Spatial Analysis (CESTA) and have consulted in that capacity on the development of Palladio, an open-source platform for all humanists to explore their data. As a research assistant for the Mapping the Republic of Letters Project, I worked on visualizing the intellectual networks of the Grand Tour in the eighteenth century and did my own case study on Charles Burney's research network (a concert-lecture based on that research can be seen/heard here: http://vimeo.com/28069755). My contribution to the volume "The Palatine Wedding of 1613: Protestant Alliance and Court Festival" used historic maps to add geo-political context to the festival descriptions of the wedding journey of Elizabeth Stuart. My dissertation explored the rise of Brandenburg-Prussia in the 17th century through the lens of the food culture at the court of Prince-Elector Friedrich Wilhelm (1620-1688). Whereas this rise has typically been attributed to military success, I argue that the military accomplishments the "Great Elector" were only one part of a larger cultural program. Food at court is my systematic evidence for charting cultural values, relationships, and values at court. As part of this research, I created a parallel coordinate chart with Jason Heppler of the food consumption recorded at the palace in Königsberg, Prussia during the reign of Friedrich Wilhelm. This project is ongoing as I explore ways to see change in taste over time. You can read more about our methodology here. 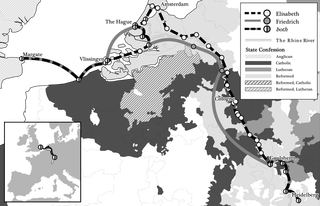 This project is a spatial history of the union of two Protestant powers in Europe before the outbreak of the Thirty Years War. 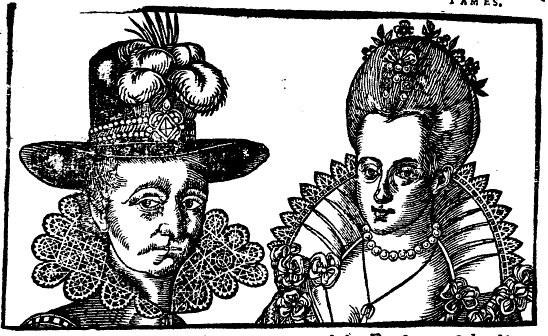 Working with Elijah Meeks and Jason Heppler, I am creating an interactive mapped version of the story of the journey of the newlyweds from London to Heidelberg, which explores the early modern confessional diplomacy behind the court festival literature from this wedding. The MRofL is the umbrella title for case studies about how knowledge was exchanged in Early Modern Europe. I work on the Grand Tour project, which utilizes metadata from 11,000 travelers to Italy in the 18th century to study and visualize the phenomenon of British and Irish travelers for education.